A Brain-Boosting, Block-Building, Make-You-Think Game! Put on your critical-thinking caps and fire up the strategic problem solving! Recreate a hidden arrangement or listen to verbal instructions. Play on teams or with the whole class. Set of 20 plastic, chunky pieces feature 4 different shapes and 3 different attributes for a real challenge! Includes 20 Activity/Question Cards and Guide. 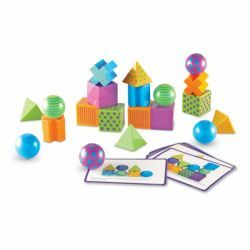 Blocks measure 2"L x 2"H. Ages 5+.